All financial reports are built up from debits and credits that make up all the recorded transactions, also called “journal entries”, on your general ledger, so here’s a quick accounting review before we dive into an intro on the two most important financial reports, or you can just jump to the income statement guide or the balance sheet guide if you want to skip the accounting primer. Here is the basic rule of accounting: Assets are equal to liabilities plus owner’s equity. That sounds kind of complicated, so let’s break it down a little. Basically, if you take the resources you own and add them to the resources your creditors give you, you have the total resources of your company. Your resources (owner’s equity) + your creditors’ resources (liabilities) = total resources (assets). We’re going to give this a try with some simple numbers. If your equity is 2 and your liabilities are 3, then your total assets are 5, because 2 + 3 = 5. Now you have 5 on one side and 5 on the other. Simple enough. But if your company does any kind of transaction, you will have at least two entries so that the accounting identity is maintained. Accounting is all about maintaining equality on both sides of the equation at every point in time. So, if you gain 2 more in owner’s equity from investing in the business or sales from a previous period, you have to balance both sides, because 4+3 does not equal 5. You need to represent that investment as what it is, an additional asset to the company (2). This adds to the existing asset value (5), for a total of 7. Both sides are now equal because 7=7. Makes sense? That asset could be cash in your bank from a sale, or a new piece of equipment you recorded in your ZipBooks account. This is called double-entry bookkeeping, meaning you make at least two entries for every transaction because you have to maintain equality on both sides of the equation. Whether you have just a few transactions or thousands, you want to verify that the accounting identity is always true, which is what companies can do with a balance sheet. How do I read a balance sheet? Balance sheets give business owners an overview of the value of all their assets, liabilities, and owner’s equity at one moment in time. It breaks out the three main areas of the accounting identity into sub-accounts so you can get a good view of what areas are affecting the value of your business the most. If we’ve capture your attention this long, it’s probably safe to assume that you’re still new to accounting and that you really want to master this material. One of the great things about ZipBooks is that it generates the balance sheet for you after you enter and classify your transactions. But it’s really helpful to know how everything works, and the way each transaction affects your bottom line. Why don’t we relate the balance sheet to something that you interact with in your everyday life? Let’s say you decided to use your money on a beautiful, decked out car for your new ride-share business. We’ll walk you through how your car purchase would impact your company’s ZipBooks balance sheet. Since you wanted a super fancy car to represent your business, you decided on one that cost $400,000. You only had enough cash for a down payment of $80,000, so you’re $320,000 short. Luckily, you’ve got some friends at the bank. With a few handshakes and signatures, the bank approved you for a mortgage loan covering that $320,000 (Ok, so we wanted to make the example relatable, but not too relatable). As long as we make monthly payments of $1,000 for the next 26 or so years, we get to keep the car. In fact, the banker was so nice, she even let you make payments interest-free until the debt is cleared. Now let’s try to set up your balance sheet with these bigger numbers. Remember, both sides should equal each other, like a scale. 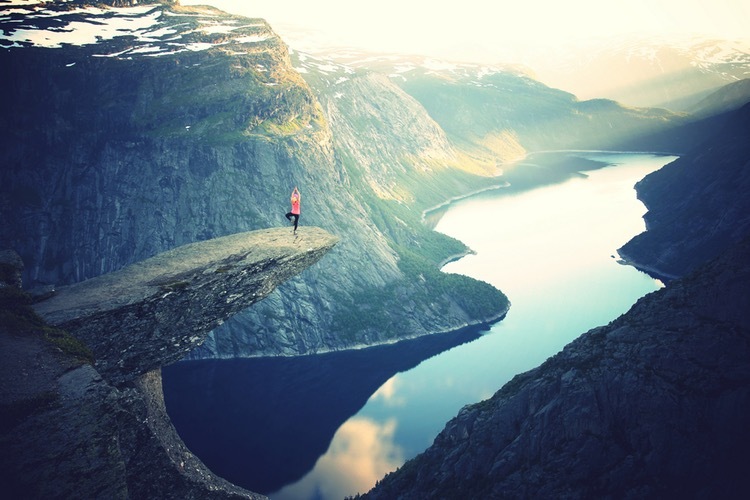 Everything put on the assets side of the balance sheet will need something equal to it to be put on the liability or equity side of the equation. 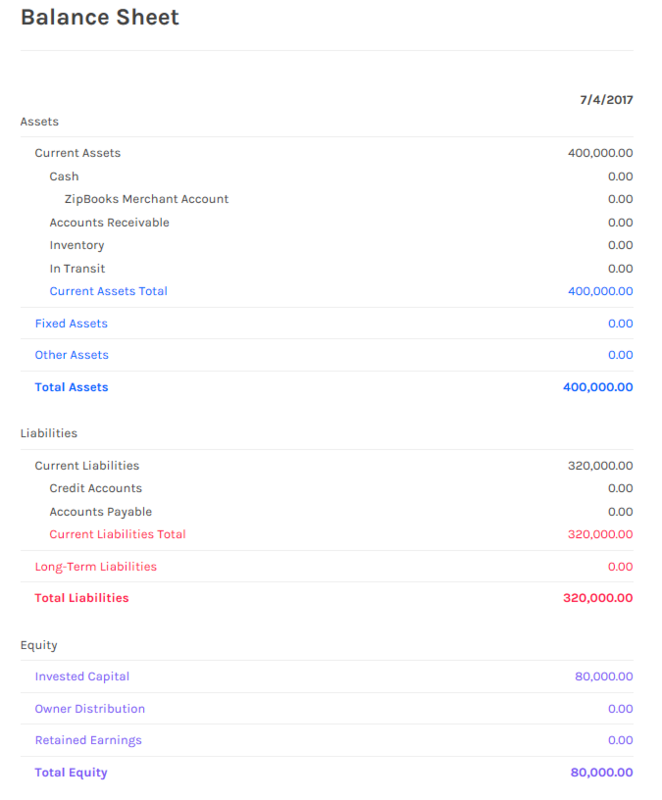 Your ZipBooks account now shows $400,000 in assets (the car). That is made up of $320,000 in liabilities (the loan) plus $80,000 in cash you’ve put into the car, which is capital that you invested in the business and is covered under owner’s equity. The balance sheet goes up $400,000 in value and your accountant is happy because both sides still equal each other thanks to double-entry bookkeeping. Perfect. Okay, now that we’re starting to make sense of the balance sheet. Let’s add another layer to this. How do we show that things are changing over time? We know that our liability will be going down with every car payment, but how do we show that? We’re going to use something called an income statement to help us out. An income statement, also known as a profit and loss statement, is how a business reflects its net income (revenue – expenses) changing over a set period of time. Let’s looks at how this purchase affects your ZipBooks financial statements after making payments for twelve months. On the top portion of the income statement, we see that you earned a $50,000 income as an employee of your own company, so the total income is $50,000. However, you also had some expenses for your business, including the payment of the loan, so you add those expenses up, including the car payments ($12,000) and put the total ($50,000) on the right side in parentheses, indicating a negative. You made $50,000, but you also spent $50,000 so you didn’t generate any profits to dump back into the business for more employees, cars, or anything else your business might need. 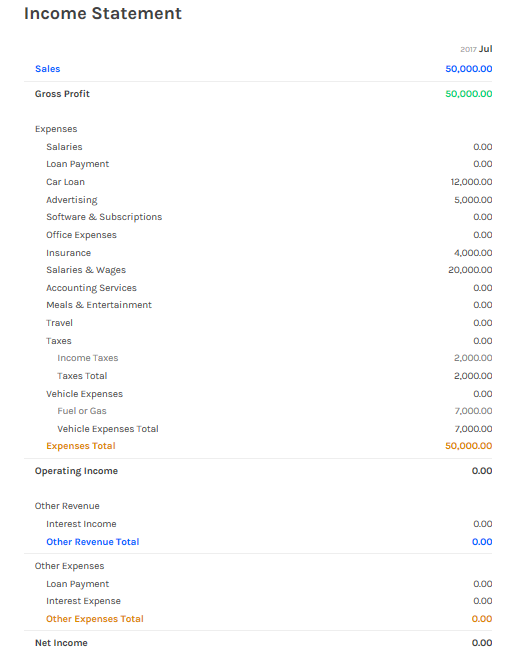 This is the beauty of the income statement that ZipBooks automatically creates for you. You’ll be able to see which areas of your business need attention, like any expenses you need to trim (or seriously hack away at). In our example of the car purchase, you can immediately come to the conclusion that something will need to change if you want your business to survive. So, you decide to sell the Pinto and buy a more reasonably priced car. The good new is that luck is on your side. When you bought the car, neither you nor the salesman knew these kinds of cars are extra rare (because most exploded in fender benders). When you go to sell the car, a collector offers you double the initial price you paid for the car. The car’s asset value is now a whopping $800,000. Before you sell the car to the collector for $800,000, let’s look at your newly updated ZipBooks balance sheet. You still have $308,000 left on the car loan, but the big change comes in the equity and assets. You’re sitting pretty with $492,000 in equity, $92,000 from your initial down payment and 12 monthly payments, and $400,000 from the increase in value from the car. After paying back all of the liabilities you owed in the form of your car loan, you’ll pocket $400,000 of straight profit from the car and even get your $92,000 back that you put in over the past year. Your gambit paid off. With $492,000 in your pocket, you can walk off into the sunset, happy that you mastered some accounting and doubled the value of your hypothetical car. Now let’s just hope you learn how to make better business decisions. You DID decide to sign up for a ZipBooks account, so your outlook is pretty good!